China plans to lift sluggish exports by promoting big-ticket items such as railways and nuclear power in overseas market after the country’s trade growth fell well short of its target in 2014. The government will step up efforts in exploring overseas markets for railway, nuclear power and other large-scale equipment by setting up joint-venture companies or public-private partnerships in targeted countries, the executive meeting of the State Council presided by Premier Li Keqiang decided on Jan 28. Industries with overcapacity, such as steel, nonferrous melting, building materials and textiles, are also included in the plan to raise exports from the world’s top trader in merchandise, said a statement released after the meeting. These industries, the statement said, will become another driving force for exports and help industrial upgrading in the domestic market. 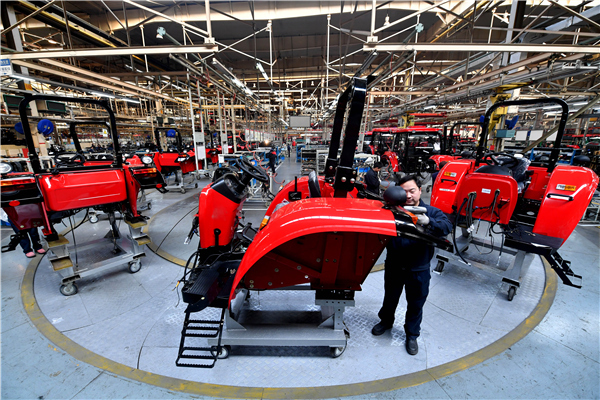 China has relied heavily on the export of large-scale equipment to boost lackluster trade that missed its growth target for the third consecutive year. Foreign trade rose 3.4 percent in 2014, far below its target of 7 percent. Exports grew 4.9 percent in 2014 to 14.39 trillion yuan ($2.32 trillion) and the surplus widened to 2.35 trillion yuan. In the latest move, China CNR Corporation Limited, a leading manufacturer of locomotives, announced a subway export contract with the United States on Jan 27, the first deal in the US rail transit market, Xinhua News Agency reported. The manufacturer will sell 284 subway trains worth 4.118 billion yuan to Boston’s Red and Orange subway lines, according to the announcement. The meeting on Jan 28 also decided to build more business incubators to provide logistics, legal and accounting services needed by the startup companies. The meeting urged local governments to streamline administrative procedures faced by small and micro-sized companies, provide offices at low cost or subsidize their rent, Internet and other daily expenses. The meeting pledged to use government-backed funds and tax exemptions to support early-stage scientific and technological companies, which often face financing difficulties because of the lack of tangible assets. Angel investors, crowd funding, regional stock exchanges and intellectual property mortgage will be encouraged to support startup businesses.